Butterfly sword set, with scabbard. 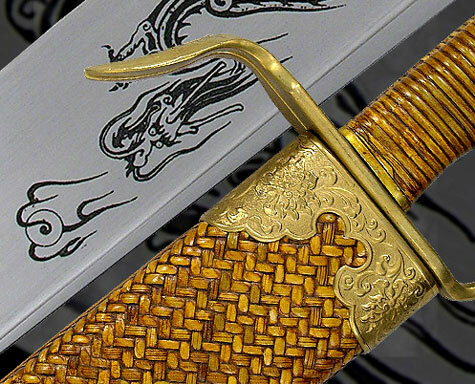 Each sword features a high carbon tempered steel blade with dragon engraving, rattan wrapped grips and solid brass guards decorated in a lotus flower scroll pattern. The lotus design is repeated on the fittings of the double scabbard (both swords fit into the same scabbard), which is encased in exquisitely woven rattan. 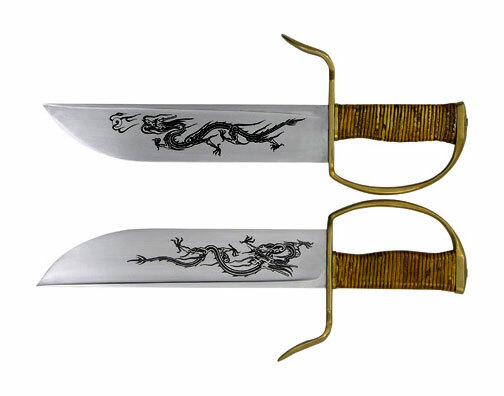 The use of butterfly swords has been honed to a fine art by martial artists in the Wing Chun and Hung Gar styles of Southern China, which emphasize precision and two-sword coordination. Made by Paul Chen / Hanwei.